Kent grower Chambers is claiming a UK first with the launch of a new prepared division for snacking products. The soft-fruit specialist’s new ready-to-eat division, which will operate under the name The Fruitery, was launched on the first day of Fruit Logistica in Berlin. 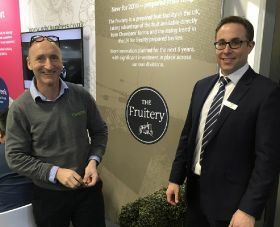 The company says the investment makes it the UK’s first specialist fruit grower to have invested in its own prepared fruit facility. Initially The Fruitery will develop own-label fruit snacking products for UK retail and foodservice, but Chambers also has ambitious plans to develop a branding and export business for its products. The launch comes following a £2 million investment in a new high-care facility on Chambers’ Kent site, which will allow it to supply fruit that is transferred from field to chilled within one hour. The move will reduce food miles and improve traceability and provenance, as well as delivering an extended shelf life of up to two days, according to the company. The first products to come out of The Fruitery include a four and five Berry Medley in 160g, 220g and 240g variants; an 80g Blueberry snack pot; a Strawberry, Apple and Grape Medley in 130g and 160g variants; a Strawberry & Apple Medley in 130g and 160g variants; and a Strawberry and Grape Medley in 130g and 160g variants. A 600g, 1kg and 1.5kg catering pack in a variety of medley options is also available. Chambers also revealed the company is exploring the possibility of selling under The Fruitery branding, and is looking at developing a brand strategy and exploring opportunities abroad. The new investment comes at a time of expansion for Chambers, which has linked up with growers around the world to offer 52-week supply and has extended outside the British season by growing plants at overseas farms in Iberia, Poland, Peru and Bulgaria. The company is a member of Asplins PO.